What can see and do on Tamborine Mountain? 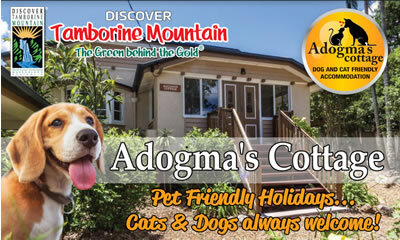 Welcome to Mount Tamborine’s ONLY complete FREE Visitor Guide map information booklet! In April 2010, “Discover Tamborine Mountain” issued the first “Discover Tamborine Mountain Visitor Guide and Treasure Map”! In October 2010, the second edition of this hugely popular visitor guide was released, followed one year later by the third edition in December 2011, now called the “Discover TM Visitor Guide” map booklet. February 2013 saw the fourth edition being released, with even more new features added (see below). Due to its continued increase in popularity, the 5th edition (for 2014) was released in December 2013 already, and the 6th edition was again issued after only 10 months end September 2014. On the right you see the cover of the 2017 edition released in March 2017. The main feature of the “TM Map Booklet and Visitor Guide” is of course a large map showing all details of Tamborine Mountain, without distortions and to scale, to enable you to find your way around without confusion! All relevant details are included in an easy-to-see format, nothing has been left out. There is also a detailed map of the famous “Gallery Walk” shopping precinct, listing all the wonderful and exciting shops and the wares they offer, restaurants and cafes, cellar doors and of course Galleries! – Tamborine Mountain Wine Trail Map – showing the locations of the best wineries on Tamborine Mountain! – Bushwalks on Tamborine Mountain incl. NEW trail maps, how to get there, where to park, how long they take and so on. You can also download and print out maps of all trails. – Lookouts to both the Gold Coast and Inland, listed from north to south, with easy find map grid references and descriptions. – Waterfalls located all over the mountain, and how to get to them, as well as where you can go for a swim! – BBQs, Parks, Picnic Areas and Playgrounds, where they are, what facilities you will find on site, and how much space there is for the kids to roam around! – Self Drive Day Tours – a variety of suggested self drive tours, covering all sorts of different interesting places to visit on Tamborine Mountain. Visitors refer to the “TM Map Booklet and Visitor Guide” as a reliable and comprehensive source of information about all there is to see and do on Tamborine Mountain! This entry was posted in Maps, Tamborine Mountain Map and tagged accommodation, map, mount tamborine, Tamborine Mountain, tourist attraction, treasure map, visitor guide on January 1, 2013 by Detlef.